(1) The tour was named to mark the closure of New Holland Pier and Consett. New Holland Pier station became banned to loco-hauled trains prior to the tour running so passengers had to walk to New Holland Pier station from New Holland Town station (which were connected by a continuous platform). 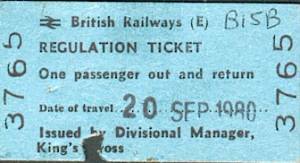 The RPPR ticket letter carried the following comment: "We must point out that we have had an extreme difficult and frustrating time organising this railtour and in 44 tours we have never had BR change their minds so many times regarding the allocation of rolling stock and motive power". 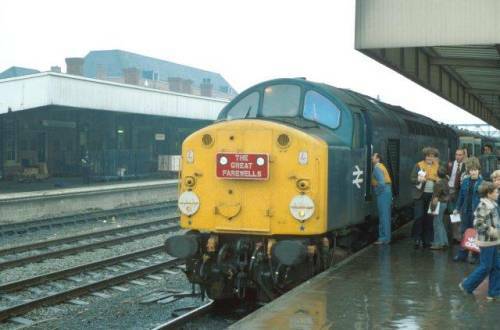 (2) A timing sheet seen by the Webmaster clearly shows the class 40 used on both legs as 40025, not 40028 as uploaded however some Internet detective work by Keith Jarrett confirms (by the position of the OHLE warning flashes) that it is definitely 40028 in the photo below, not 40025. 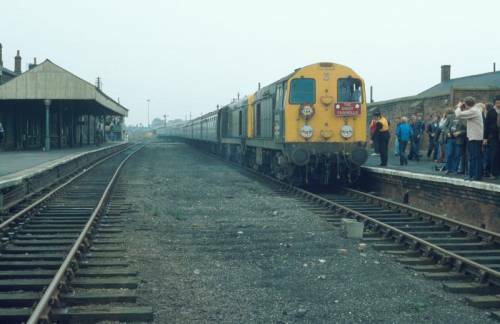 William Shelford further confirms the use of 40028 on both outward and return legs, thus that query is considered firmly quashed. Welwyn Garden City 07/55 07/55 ? ? Connington South Jn 08/44 08/53½ ? ? Barkston South Jn 09/34 09/34 21/35 ? Loversall Carr Jn ? 10/06 ? ? York Yard South 14/18 ? York Yard North 14/25 ? King Edward Bridge 18/34 ?